Often times we will expect to have good whales in January and in some years it even takes until February before the leviathans really start to show up in notable numbers. This year, however, saw scores of feeding humpback whales on the outset of the season and we continued to see them in unprecedented numbers throughout February. 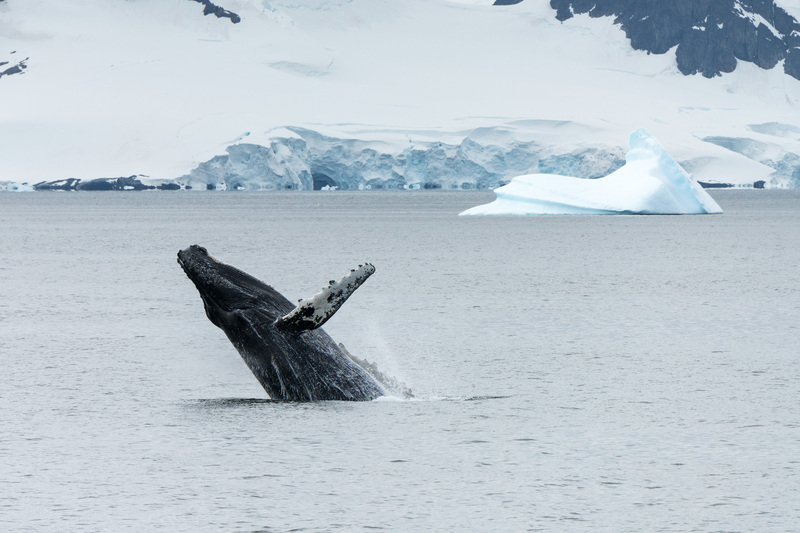 After spending the austral winter in the warm breeding grounds off of Brazil, this population of humpback whales migrated back to Antarctica to take advantage of the largest bounty of food on the planet, Antarctic krill. With densities not seen in any other animal, Antarctic krill can be easily corralled and gulped by all manner of baleen whales from the diminutive minke whale to the largest animal ever, the blue whale. Falling somewhere between the two extremes of whale size lies the humpback whale, the aerial and aural master of the whale world. Whether it’s cruising the Gerlache Strait during sunset from your luxury yacht or standing on sea ice in a protected bay, whale watching seems to always be an option because there’s never a whale too far away. Perhaps the most magical moments are those best afforded at eye-level, when guests can disembark into Zodiacs and experience an intimate encounter. Sharing such a beautiful wilderness with a beautiful, intelligent creature should be on everyone’s bucket list, and we can get you there comfortably and safely. Traveling in small groups on expedition yachts like Legend or Hanse Explorer offers the most intimate and comfortable way to view one of Earth’s great wildlife spectacles. On all our expeditions, we embrace flexibility, often adjusting plans to take advantage of these unplanned moments that are often considered the highlight by our guests.